As online debate becomes more and more common I’ve been observing how hard it is for two people to have an effective dialogue without being face-to-face. (Not that all face-to-face debates go well either!) I want to offer several dialogue tips to help you have more effective dialogues in any medium. Authors note: The embedded image in this post contains very mild language, and the article I’m linking to has language as well. It’s not always easy to tell why a given online exchange goes badly. Sometimes it just feels like nothing is being accomplished, even if the debaters aren’t antagonistic toward each other. I think sometimes this is because online debaters are too direct with each other. 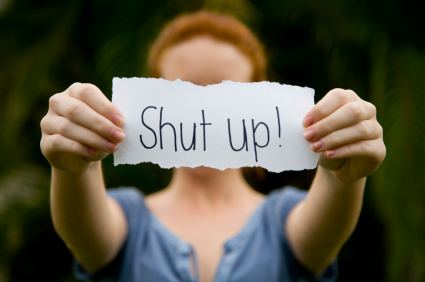 A significant portion of communication happens nonverbally, and that is all lost online. In my experience, you need to add some niceties and hefty doses of common ground to keep an online dialogue from ending with people just getting angry at each other. But sometimes something else gets in the way, and I think most of the time, one or both people are not disagreeing well. I stumbled upon a wonderful essay by Paul Graham on different ways to disagree with people, in their order of effectiveness. You should read the entire essay, (language warning,) but I’ll summarize it here. The bottom levels are the most common, especially on places like YouTube where commenters just scream (or type in ALL CAPS) at each other, and the top level is the most effective. I think I see people simply contradicting each other the most often. Instead of responding to the persons argument, they lazily reply by restating what the opposite view is. People on both sides of the abortion debate do this all the time. Pro-Life Person: What do you think about abortion? Pro-Choice Person: I think abortion should be legal because of the terrible things that would happen to women since dangerous abortions would keep happening underground. Pro-Life Person: Well, abortion’s wrong because it stops a beating heart. Pro-Choice Person: Why are you trying to make abortion illegal? Pro-Life Person: I think elective abortion should be illegal because it kills a living, human organism, and I think all human beings deserve an equal right to life because human beings are intrinsically valuable regardless of what they can do functionally. Pro-Choice Person: Well, abortion should be legal. There’s too many poor people that need abortions right now. Clearly this method of disagreement is unpersuasive to everybody involved. I strongly encourage you to read Graham’s short essay explaining the different levels of disagreement. Question: Have you had a frustrating debate recently? Which of the levels of disagreement was the person using? 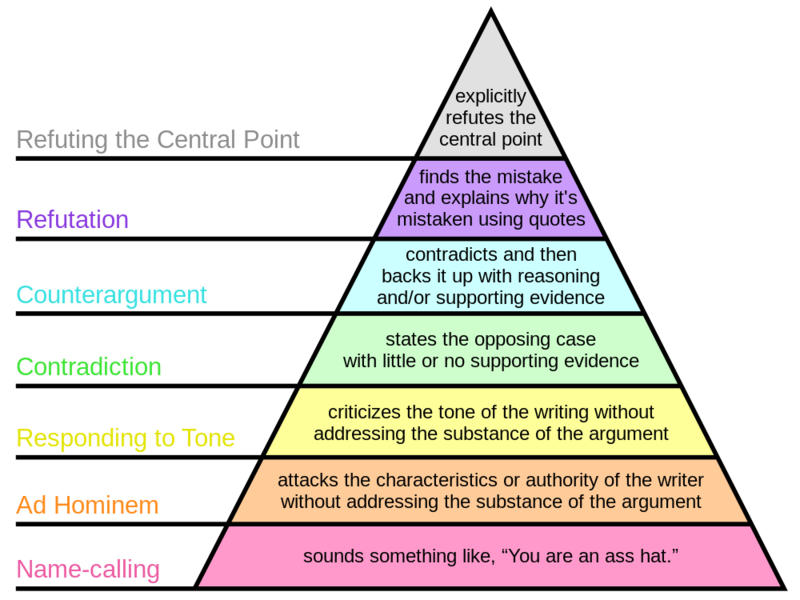 For bonus points, tell me a story about you using one of the bottom four levels of disagreement.